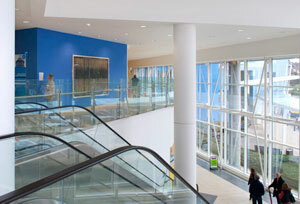 Four photographs of images of gut flora are installed in the stairwells in the Academic Centre. These have been created by Dr Nicola Fawcett, MRC Clinical Research Fellow at the Nuffield Department of Medicine, with photographer Christopher Wood. Dr Fawcett writes, "A healthy gut is like a forest, or garden, where microbes grow in a diverse, balanced ecosystem, keeping us healthy and protecting us from infection. Antibiotics can alter this balance, leading previously harmless colonisers to grow unchecked, and encouraging the difficult-to-kill, resistant bacteria to take over. "These images were created using gut bacteria and antibiotics, as an exploration of the research themes of the Antibiotic Resistance in the Microbiome OxfoRD (ARMORD) study. The bacteria were stamped in botanical designs onto colour-changing nutrient jelly, and grown with paper discs infused with antibiotics. "We are already seeing bacteria which cannot be treated with 'last line' antibiotics. Here you can see discs containing commonly-used antibiotics in hospitals. Only one antibiotic is able to prevent the dark-blue bacteria growing around it - this is our 'last line' drug meropenem. None of the other antibiotics are effective: the bacteria are 'resistant' to all but one of the antibiotics we have available." Modern medicine (including surgical operations and cancer treatment) depends on having effective antibiotics to protect people from infection; these are already running out. In January 2012 three enormous tapestries were installed in the John Radcliffe, the result of a five-year collaboration between artist Susan Morris and Dr Katharina Wulff, scientist in Circadian Neurosciences at Oxford University. Two tapestries are at either end of Level 3 in the Academic Centre, the third is on LG1 in the West Wing, near the entrance to the Eye Hospital. The tapestries are not only beautiful works of art for patients, staff and visitors to enjoy but highlight our patterns of sleep and wakefulness in today's 24/7 society, raising public awareness of so-called 'social jetlag': the rising drift between our innate biological clock and the manmade routines that modern society imposes on us. Throughout 2010, Susan Morris wore a sensor on her wrist called an Actiwatch, which simultaneously recorded the levels of light that she was exposed to and her patterns of sleep and activity. From this data she created three tapestries - two reflecting her activity over 2010 and 2011, and the third showing her exposure to light during 2011. Each column in each tapestry is a day with a sequence of 1440 threads from top to bottom, representing minute-by-minute changes of activity or light. There are 365 columns across the tapestries; one for each day of the year, starting from 1st January at the top left corner. 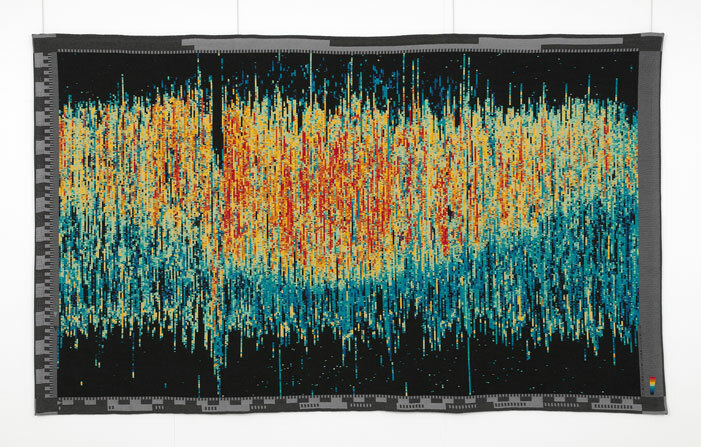 In the 'activity' tapestries, the colour scale from dark to bright indicates levels of low to high activity - thus the black areas indicate minimum or low activity (i.e. sleep) and those in red show maximum activity. The tapestry translates the artist's unique pattern of daily activity, wakefulness and sleep into a tangible pattern for public contemplation. In the 'light' tapestry, dark to bright colours indicate low to bright light, and the artist's invisible, volatile ambient exposure of daily light is turned into a visible impression. The tapestry clearly shows the artist's exposure to seasonal fluctuations of natural light, even in an urban city such as London with 7.5 million people and enormous light polution. The tapestries represent a continuation of Susan Morris' artistic practice that investigates the link between automatic drawing and writing, and a kind of displaced self-portraiture. The work also represents a unique collaboration between the artist and the weaver Marcos Luduena-Segre, of Fladers Tapestries. This is the first time Morris has worked with tapestry, converting half a million data points directly into coloured thread. Dr Wulff uses non-invasive technologies - such as activity monitoring - in her research to explore rhythms of our behaviour, physiology and environmental light that drive us to sleep and wake at certain times of the day - often in conflict with the manmade routines imposed by modern society. The effects of electrical lighting, of organising ourselves around a 'working day' and, more recently, of a 24-hour lifestyle, often operate at the expense of our natural sleep patterns. The ensuing conflict risks damage to both mental and physical health. Sun Dial: Night Watch was funded by a Small Arts Award from the Wellcome Trust, with additional support from Oxford Biomedical Research Centre, the Nuffield Laboratory of Opthalmology, University of Oxford and Oxford University Hospitals, and developed in collaboration with artlink, the Trust's arts programme. The artist would also like to thank Andrew Campbell for writing the scripts necessary to convert the Actiwatch data into a form readable by the looms.